So, I love a good white elephant gift exchange. I like the opportunity to think of the weirdest, creepiest, funniest gift possible. Unsurprisingly, this year that included a portrait. I thought it would be so funny if someone who was not the person depicted ended up with the portrait. Some groups say that the white elephant exchange includes requiring each person to display their gift in their home for an entire year. That wasn't the case with our game, but I think the recipient will. 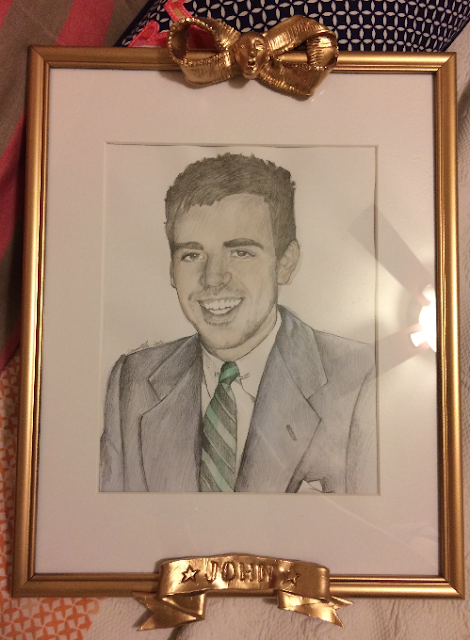 So, my gift was this portrait of one of our hosts, John. To jazz it up, I bought a dollar store frame and added some sculpted details. Notice that the bow at the top has a head in the center...just to be weird. Then I added a ribbon banner at the bottom with his name. Then, as you can see, I spray painted the whole frame gold. One person opened the gift, and I'd say it was a hit. And then it was stolen by one of John's best friends who, I think, will actually hang it in her home. My day was made. All right. I must do work. Happy Monday!